Lindsay Lohan dodged serious jail time again Thursday when a judge ruled she did not violate probation, but the troubled starlet still got an earful from the bench. Los Angeles County Judge Stephanie Sautner gave the "Mean Girls" star a stern warning about keeping her nose clean while she finishes out her sentence of house arrest. While Sautner seemed to concede that a previous judge's order of periodic testing was for illegal substances and not alcohol, she took issue with Lohan's continued partying. "Don't give people reason to hate you," Sautner said. "Don't do stupid things that fly in the spirit of the court's order. "You know I sentenced you to jail. You know I didn't sentence you to house arrest, and what do you do? You have barbecues at your house so your neighbors are writing letters about you," Sautner continued. Sautner told Lohan not to have parties at her Venice Beach home, where she is under house arrest, and to limit her company to family and one friend at a time. Shawn Chapman Holley, Lohan's attorney, said the actress obeyed all laws. It was unclear if the ruling was because of when Lohan was tested or what she was tested for. "I don't know if she drank alcohol or not...But she is permitted to drink alcohol in her home," Holley said. "Alcohol is not a violation of her probation." Based on the order given by Judge Fox in October 2010, Lohan was to submit to testing from Jan. 3 through Feb. 25. The test that Lohan allegedly failed on June 13 fell outside of those dates. In addition, the order stipulated that Lohan was to be tested for controlled substances, which would not include alcohol. "This is not a technicality; this is sloppy judicial and legal work," said former Los Angeles County Deputy District Attorney Robin Sax, who was inside the courtroom during the proceedings. Lohan is currently under house arrest, having been released from jail and given 35 days' house arrest due to overcrowding. She was handed a 120-day sentence on April 22 for a prior probation violation. "I'm so worried about my daughter," the actress' father, Michael Lohan, told Radar Online. "I'm very, very concerned about the people around Lindsay and the pressure being put upon her. If it turns out that the test was positive, then I have strong concerns because if a person can't stay straight in the house where can she stay straight?" Lohan last week denied partying under her own roof while under house arrest. 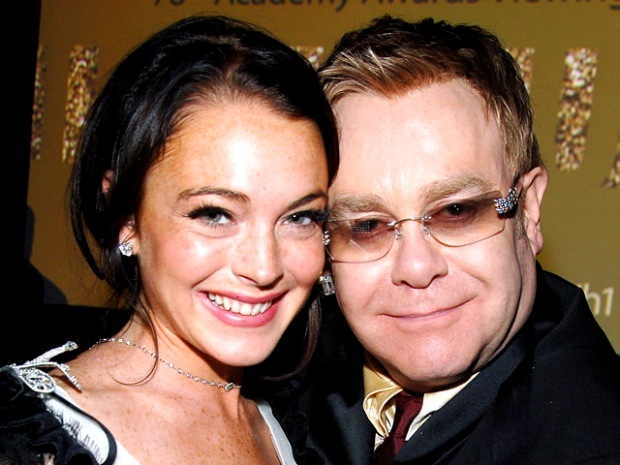 Elton John gave Lindsay Lohan some hard-hitting advice on the red carpet to his AIDS Foundation fundraiser in Manhattan Monday night. The British music idol, who battled cocaine and alcohol addictions of his own, said the embattled pop starlet needs to go to rehab and get rid of her family, whom he dubbed "enablers." "When my friends come over, they're not drinking," she told Life & Style magazine. "Alcohol is not in my house, so it's not part of my life." Lohan's seemingly never-ending troubles stem from a 2007 DUI arrest. She spent two weeks in jail last summer for violating probation by not going to court-ordered alcohol treatment sessions. From there, she went into a 90-day rehab stint, also ordered by the court. She was again found to have violated her probation by allegedly swiping a $2,500 necklace from a Venice boutique just days after leaving rehab. That landed her the term she is currently serving. Selected Reading: MTV.com, CNN, New York Daily News.